By Joseph Fitsanakis – IntelNews: Western audiences were treated to a small taste of the bizarreness of Eastern European politics this week, when a Russian journalist who had reportedly been assassinated by the Kremlin, made an appearance at a live press conference held in Kiev. On Tuesday, Ukrainian media reported that Arkady Babchenko, a Russian war correspondent based in Ukraine, had been shot dead outside his apartment in the Ukrainian capital. A day later, after Babchenko’s murder had prompted global headlines pointing to Russia as the most likely culprit, Babchenko suddenly appeared alive and well during a press conference held by the Security Service of Ukraine (SBU). The SBU then said that Babchenko’s killing had been staged in an attempt to derail a Russian-sponsored plan to kill him. 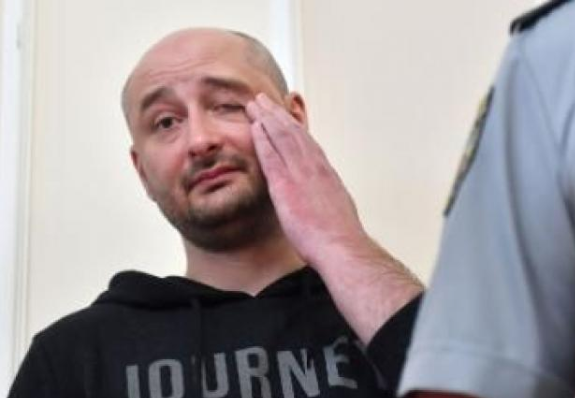 The bizarre incident concluded with Babchenko meeting on live television with Ukrainian President Petro Poroshenko, who praised him as a hero. Later that night, the Russian journalist wrote on his Facebook page that he planned to die after “dancing on [Russian President Vladimir] Putin’s grave”. Welcome to Ukraine, a strange, corrupt and ultra-paranoid state that is on the front lines of what some describe as a new Cold War between the West and Russia. Like the Cold War of the last century, the present confrontation is fought largely through information. The Russian government, which appears to be far more skillful than its Western adversaries in utilizing information for political purposes, immediately sought to capitalize on the Babchenko case. In fact, this baffling and inexplicable fiasco may be said to constitute one of the greatest propaganda victories for the Kremlin in years. As one would expect, Russia stuck to its guns on Tuesday, when the world’s media announced the death of Arkady Babchenko in the Ukraine. Moscow claimed once again that we were dealing here with a false flag operation that was orchestrated by anti-Kremlin circles to make Russia look bad at home and abroad. It turns out that Moscow was right. Babchenko’s “murder” was indeed a false flag operation —admittedly a sloppy, shoddy and incredibly clumsy false flag operation, but a false flag operation nonetheless. Moreover, Babchenko’s staged killing could not possibly have come at a worse time for Ukraine and its Western allies. In the current environment, global public opinion is extremely sensitive to the phenomenon of ‘fake news’ and disinformation. Within this broader context, the Ukrainian state and its intelligence institutions have placed themselves at the center of an global disinformation maelstrom that will take a long time to subside. In doing so, the government of Ukraine has irreparably harmed its reputation among the general public and in the eyes of its Western allies. The Kremlin could not possibly have asked for a better gift from its Ukrainian adversaries. The amateurishness and recklessness of some Eastern European countries that the West sees as allies in its confrontation with Russia, such as Ukraine, Poland, Hungary, and others, would be humorous if it were not so dangerous. The manifest idiocy of the Babchenko fake plot also poses serious questions about the West’s policy vis-à-vis Russia. It is one thing for the West to be critical of the Kremlin and its policies —both domestic and foreign. It is quite another for it to place its trust on governments and intelligence services as those of Ukraine, which are clearly unreliable, unprofessional, and appear to lack basic understanding of the role of information in international affairs.